Body-swapping fantasy comedies are not necessarily a superabundant genre, but they have a curiously high ratio of canonization. Big, Freaky Friday (both the Jodie Foster and Lindsay Lohan versions, thank you very much), and 13 Going on 30 all manage to have some lingering affection despite their daffy premises; they are at the very least considered reliable plane movies. The adult-to-child or vice versa switch seems to be crucial (nobody talks about The Switch anymore, probably for the best); these movies always seem to hinge on the idea that by living for a period of time as either a younger or older person one can gain insight on life’s problems unavailable to them from the prison of their regular, age-normative body. It’s a cute idea we’d all love to believe in that can immediately get dicey once you get into specifics. (Anyone who loved Big as a child and has since gone back to ponder the implications of its love scene can attest to this.) But beyond questions of age-appropriateness and consent, there’s also the larger idea of what, exactly, the body swapper stands to learn. Into this questionable pantheon shuffles Little, from director and writer Tina Gordon Chism, on her second back-to-back project with producer Will Packer. 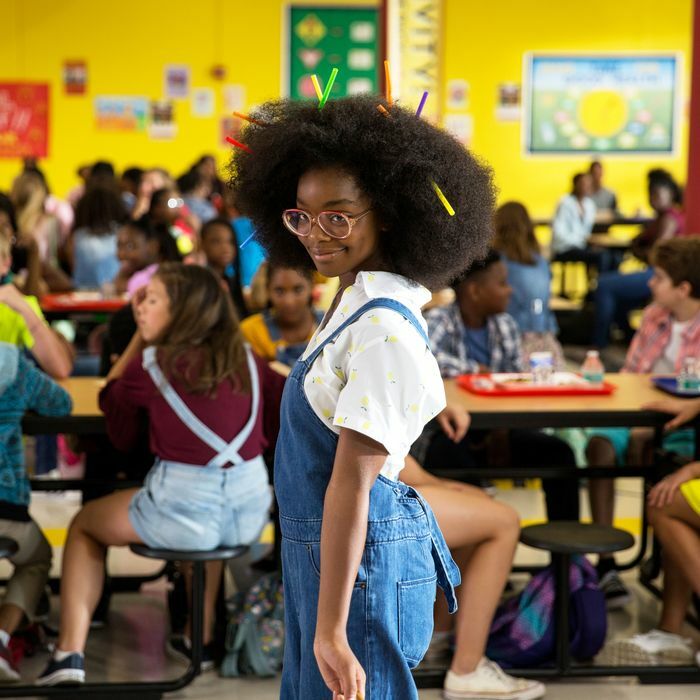 Little, as its title suggests, takes Big’s premise and reverses it — what if a grown and successful woman (Regina Hall) woke up suddenly in the body of her child self (Black-ish’s Marsai Martin)? Would it help this bossy tyrant become a better person? It’s tempting to wave away the premise of Little, with it’s bright and sunny production design and straight-from-the-can score, as silly fun that one needn’t think too deeply about. Sure, it’s built around an exceedingly arbitrary pitch-deadline plot structure (an entitled white man needs a “really great tech idea” in 48 hours or else! ), but it’s also got a couple of very fun performances from Issa Rae, as Jordan’s long-suffering assistant, and particularly Martin, whose diminutive-yet-statuesque physicality and way around a deadpan head turn is a delight from beginning to end. (Hall is unfortunately underutilized, if present in spirit, through most of the film.) But as many times as I tried to get onboard with its proposed brand of breezy fun, it kept kicking me off, if only because I found myself running up against the very foundation of its premise. Perhaps we can begin with the implicit idea that an apparently very successful black woman in tech is in cosmic need of literally being taken down a size. Hall’s Jordan more than proves her boss-from-hell bona fides in the film’s opening minutes, berating April for not placing her slippers correctly by her bed, and cracking jokes about the gender identity of her neighbor’s child (just the first of several unfortunate “yikes” moments in the film). When she arrives at the office, the staff literally run as if someone had pulled a fire alarm. Okay, she’s mean. But thanks to a flashback prologue of an ambitious but tormented Jordan in middle school, we know we have to have sympathy for her because deep down under that callous exterior is that insecure little girl. It’s the kernel of emotional truth to Little that lifts up its gags and keeps it chugging even when it irretrievably loses the plot. But it also makes one wonder if a forced revisit with adolescence is exactly what we want to see Jordan deal with. Jordan needs to grow up, not continue stewing in the injustices of her childhood. “Seeing the world through her child self’s eyes” feels like the cure for an entirely different ailment, and the game of Little feels confused from the get-go. In Jordan’s absence, April (the only one privy to the magical switch) learns to be more confident at work, confident enough to pitch an app idea and initiate a relationship with a co-worker. Even as Jordan is forced to go back to school and learn lessons about teamwork and kindness, she’s unwittingly started April on the path to being the next Big Unhappy Boss Lady. The cycle of Girlbossiness continues apace, and despite Little’s voiced-over coda urging us in the audience to pay no mind to anyone who doesn’t want us to live our best life, I couldn’t help but think that this reigning wisdom of our times is as much from the mouths of babes as it is from bosses.